This Fall, Georgetown Law welcomes the addition of adjunct Professors Jason Tashea and Keith Porcaro, who will lead a new project-based practicum on Criminal Justice Technology, Policy and Law. The practicum explores how technology is changing the nation’s criminal justice systems through two critical lenses: how well technology-augmented tools and approaches further their stated policy aims, and how technology changes power relationships between government and citizens. We spoke with Professors Tashea and Porcaro to discuss their goals for the course and the projects students will be working on this semester. Responses below have been edited for clarity and length. This practicum is a brand new offering at Georgetown Law. What are some of the main topics you will cover, and what do you hope students take away from the course? JT: We split the course thematically into two tracks: one track will cover the controversies around the use of technology and data in the criminal justice system, and the other will focus on practical approaches to designing and building legal and policy tools. The first track will look at the impact of new technologies on individuals’ constitutional rights, and will explore civic technologies which are being used to improve access to and understanding of the criminal justice system. KP: The second track gets students thinking about the implementation of digital tools in a structured way. We’ve invited several guest speakers, and students will work in groups throughout the semester to apply these concepts to current challenges that lawyers, nonprofit organizations, and governments are facing across the country at this moment. What projects will the students work on? KP: We have two partner organizations this year. One is from Harris County, Texas, where judges assign public criminal defense cases to attorneys using the "Wheel" System, a rotating list of pre-approved lawyers. The Texas Criminal Justice Coalition (TCJC) have tasked our students with investigating whether it is possible that judges may be appointing attorneys who are more likely to donate to their re-election campaigns, or attorneys who tend to plea out cases faster and more frequently. This project isn’t a hunt to identify systemic corruption, but it is an exploration of a unique structural element of one system’s approach to criminal justice. 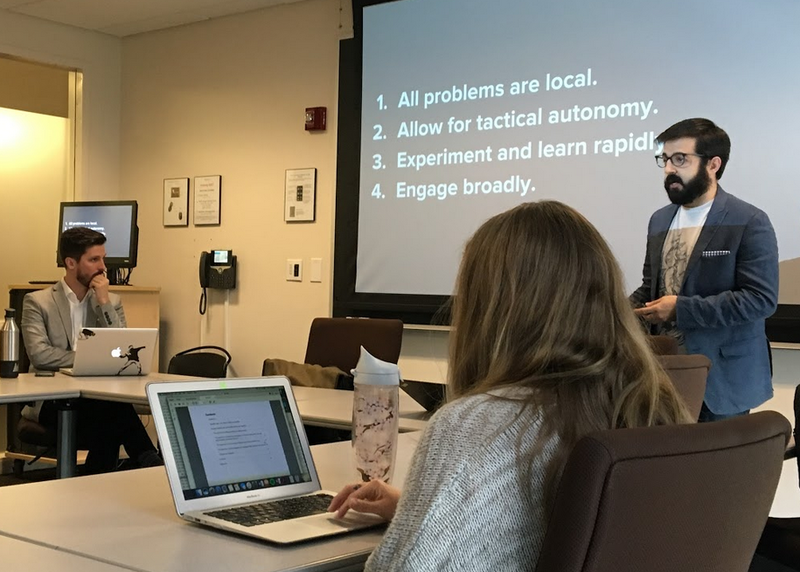 And it’s an opportunity for students to move beyond reaching a conclusion they may find objectionable, to understanding how an organization with limited resources might choose to deploy those resources in order to affect a change in policy. JT: An underlying theme of the course is learning to approach legal and policy issues as part of an ecosystem—involving both development of tools and data but also concerning how people look at the system itself. Law school is very good at teaching students to think about discrete legal topics and issues. We hope to pull students away from that magnifying glass and, through these projects, acknowledge and understand the larger ecosystem. The other project comes to us from the Maryland Governor’s Office of Crime Control & Prevention (GOCCP). Last year Maryland’s legislature passed the Justice Reinvestment Act (JRA). It’s one of those once-in-a-generation reform packages, which will entail substantially reallocating money and resources traditionally meant for incarceration and punishment towards rehabilitation and treatment. The GOCCP is excited to be able to use a model developed by our students to better understand how the JRA will affect their systems and budgets so that when they go to Annapolis to lobby, they will have an informed sense of what they ought to be lobbying for. "Law school is very good at teaching students to think about discrete legal topics and issues. We hope to pull students away from that magnifying glass and, through these projects, acknowledge and understand the larger ecosystem." How are you using guest speakers to contribute to students’ appreciation of the legal and policy issues related to new technologies? JT: Matthew Stubenberg, for instance, has done a lot of interesting work scraping the Maryland court database system. He’s created an easily navigable database that enables non-profits and other organizations like The Baltimore Sun to better utilize court data, for example to unearth systemic issues or to develop tools that improve access to the justice system. One thing we are trying to reinforce through our guest speakers is that these projects are never done; they only die. To keep these projects alive means not only retaining the people power that fuels them, but also an unending search for funding mechanisms necessary to maintain them. How do you see technology impacting power dynamics in our criminal justice systems and elsewhere? KP: Technology is usually a good amplifier for existing dynamics, so in a criminal justice system designed around the provision of procedural checks against the power of the State, it is fair to ask whether that new element bolsters or erodes those established checks; whether it exacerbates or alleviates perceived tensions in pre-existing procedures. For example, the addition of something as seemingly innocuous as a text reminder for a defendant to appear in court. The power dynamics at issue may be entirely dependent on who sends the message—if it is the defendant’s attorney it is probably a privileged communication, but if the court sends the reminder, it would not be privileged. And an enterprising prosecutor could check the cellphone records and see when the defendant received the message, and also whether they used their phone afterward. They could use that as another stick, which could further exacerbate the power dynamic between defendants and the courts. Are there any technological developments you’re paying particular attention to right now, or that you think people should know more about? JT: In my opinion, attention should be paid less to any given technology—everyone always wants to talk about an app or a software program, but that is the wrong thing to be thinking about. Ultimately the questions are about data quality, transparency, and security. For instance, the need for transparency around the algorithms that are influencing bail and sentencing decisions. Technologies come and go, but these underlying questions will remain perennial regardless of whether we are talking about a regression analysis algorithm or a neural network that comes a few years down the road. "Technology is usually a good amplifier for existing dynamics, so in a criminal justice system designed around the provision of procedural checks against the power of the State, it is fair to ask whether that new element bolsters or erodes those established checks; whether it exacerbates or alleviates perceived tensions in pre-existing procedures." Tell us about your backgrounds and how you became interested in technology and the law. JT: The real jumping-off point for me happened while I was working in Kosovo. Even though my work was focused on juvenile justice, the interesting thing to me was the country's focus on being recognized by the international community. The people of Kosovo found a lot of momentum getting companies like Amazon to make sure that Kosovo was an option in the country pull-down menu, so they didn’t have to say they were either part of Serbia or Albania. Kosovo was also the first time I encountered a civic tech ecosystem where people were trying to essentially code their way out of their government’s failures, and their government’s inability to deliver services. Those two elements to me were absolutely fascinating—they were the impetus for everything I’ve done since. KP: I’m a lawyer by training, but I found my way into several tech jobs by accident in college. For the first few years out of law school, I was working in-house for tech startups and helping them deal mostly with operational issues. Right now, one aspect of my work at the Berkman Klein Center for Internet & Society at Harvard University is figuring out how to explain complex systems to ordinary people, finding ways to incorporate simple and straightforward interfaces. Fuller understanding of these systems could really change people’s perceptions of and engagement with those systems. We are supposed to be participants in determining the laws we have and how people should behave, but meaningful participation is to an extent predicated upon being able to understand how the system works, holistically. And that is one of the goals of our practicum.